Mignon McLaughlin was born in Baltimore, Maryland, and grew up in New York City, where her mother, Joyce Neuhaus, was a prominent lawyer. Mignon graduated from Smith College in Northampton, Massachusetts, in 1933 and returned to New York, where she embarked on a career as a journalist and a powerful and touching writer of short stories for Redbook, Cosmopolitan, and other women's magazines. She worked for Vogue magazine in the 1940s, and was Copy Editor and Managing Editor of Glamour magazine in the 1960s and early 1970s. With her husband Robert McLaughlin—an editor at TIME Magazine—she wrote the play Gayden, which had a limited run on Broadway during the 1949 season. McLaughlin authored the first and second Neurotic's Notebooks. She retired Mignon McLaughlin was born in Baltimore, Maryland, and grew up in New York City, where her mother, Joyce Neuhaus, was a prominent lawyer. 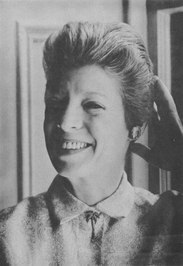 Mignon graduated from Smith College in Northampton, Massachusetts, in 1933 and returned to New York, where she embarked on a career as a journalist and a powerful and touching writer of short stories for Redbook, Cosmopolitan, and other women's magazines.